We all need to keep practicing our skills otherwise we get dull. When it comes to birding it doesn’t take much to get sloppy. 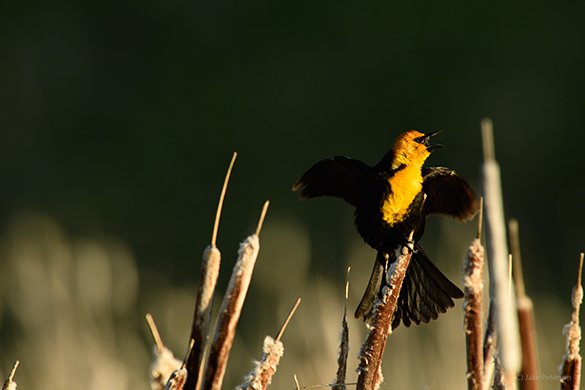 Two species that are quite common in the US and make for good practice are the Yellow Headed and Red Winged Blackbird. They may not be that sought after but that means you can work them with no one else around. Black subjects are also harder to work with because they really challenge your skill when it comes to lighting. You have to really watch the perches the birds keep landing on and where the best light is to bring out that detail. Interestingly enough some of the best days to work with a dark subject, like above, is on an overcast day where you won’t get those harsh shadows. I say interesting because we tend to avoid those days. So head to your local waterways to find these guys. Spring is a great time to be working with birds and one of the best spots to go is your local pond. You’d be amazed at what you can find at those public waterways. 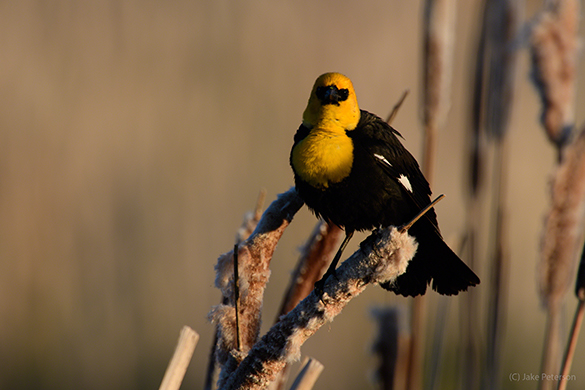 Often times it’s local species that are more on the common side but that doesn’t mean they don’t deserve attention, like Yellow Headed Blackbirds. These guys are constantly calling for mates and with their striking yellow head and black body they make for an easy photo subject. 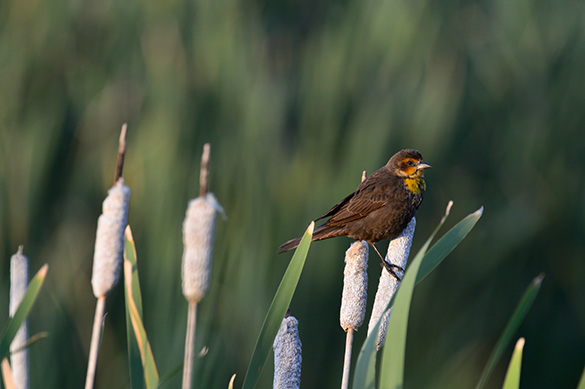 If you want to get better at working with birds, start at the ponds. Since yesterday I talked about Mammals today seemed perfect for birds. I truly love photographing birds because they provided a unique challenge that Mammals don’t. Birds don’t hold still. Granted most mammals tend to move around a lot but not like birds. Birds seem to be notorious for going to the one branch you don’t like and then smiling about it. All of that is part of what makes it so much fun. I’ll start off by saying the one thing everyone likes to talk about, yes the right lens is important in this area. 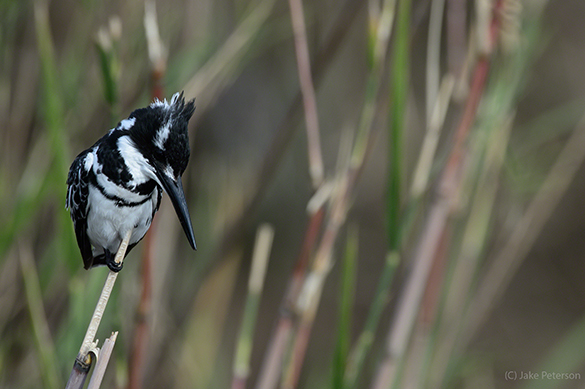 If you want to photograph birds you need something like a 70-300, 200-400, 600 or even 800. While everyone thinks it is to get the subject bigger in the frame, and that is true it does help, it is mainly for isolating background. Finding a good, clean background with birds isn’t easy having a longer lens helps. The exception to that is if you have your own bird station setup in which case it becomes a controlled environment. Now birds don’t have the same body behavior as mammals do. They are much more vocal and frankly if they are unhappy, they leave. That’s what they do. The great thing is they are birds everywhere! 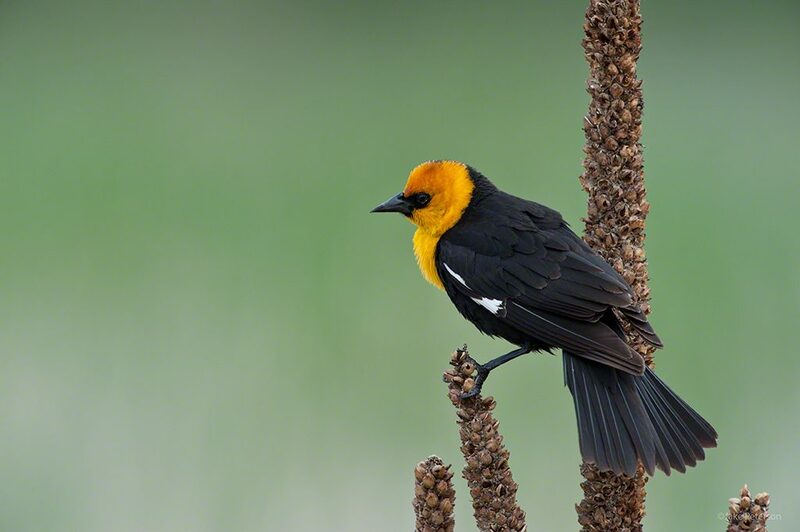 From common North American species like the Yellow Headed Blackbird or to African species like the Pied Kingfisher, there is always something to shoot if you put in a little effort. I talk about technique and a whole lot more in my class at Photoshop World this week but I know not everyone is going to be at Photoshop World and knowing this they did something really clever this year by having the instructors who are teaching on the Expo floor put their classes on their website. So if you go to the top under tips, classes, downloadable classes you will see a link where you can download a PDF of my class. Isn’t that handy! 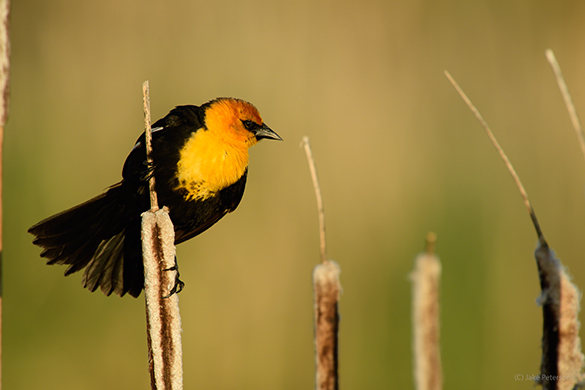 There are a lot of great bird species here in Montana but I always find time for the common species like the Yellow Headed Blackbird. It’s just a great photographic subject for multiple reasons. First off it’s a very approachable species. It’s easy to setup, be patient, and they will just come in around you as they mate. Of course there is also a lot of them around which makes finding a workable subject easier too. The next reason is they have a natural contrasted color pallet which really stands out. That yellow on black is so vibrant that it’s literally impossible not to pick them up. There are of course comes the lesson. While it’s a great species to work with it’s still a common species and thus gets photographed a lot. Being creative while photographing this species is paramount. This shot being a more typical one, tight with the D5, 600 f/4 and 1.7 Teleconverter. By changing directions, we are still able to use good light but the background changes to a darker one which naturally makes that yellow head pop as opposed to blending in. It’s a simple move to make that can have a huge impact on the overall image. I often wonder if it’s better to go after more illusive and “prized” species no matter how good the light may or may not be or if it’s better to work with whatever may be in front of you with good light? 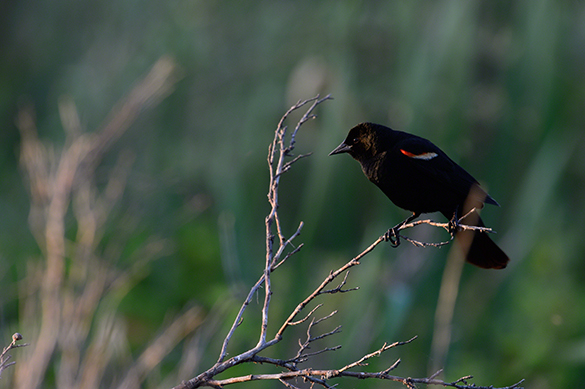 There are those species that are just everywhere and you see them and say to yourself, “do I really need another shot of that bird?” I picked two perfect examples of just, the Yellow Headed and Red Winged Blackbird. Most of you reading this are probably saying, “oh yea I’ve seen that bird.” Not to surprising considering they are everywhere. While they do attract some attention with their bright minimal color contrasted against there black bodies, they are still a common bird. These were taken down at that marsh by the Gallatin River I had found and in the setting evening light there wasn’t a whole lot else except for a very uncooperative little Yellow Warbler. Now I didn’t really need more of these two species unless it was something truly unbelievable, but if you saw my post from yesterday then you know there was some absolutely gorgeous light that evening and anything would’ve looked good in front of my lens. The lesson isn’t that one way is right and the other wrong but if you can capture a good image then it really doesn’t matter what’s in front of your lens as long as your having fun.